YourPrivateProxy Review 2019 - Does YPP Datacenter IPs Good for Sneaker sites? YourPrivateProxy is an amazing private proxy service offer the Elite HTTP(s)/SOCKS5 Proxies, virgin Dedicated IPs work well on Footsites. YourPrivateProxy offers you quality dedicated proxies for anonymity and security on the Internet. If you’re on the lookout for speed and quality to get the optimum results with your software and proxy needs, then it’s a good choice for you to check out YourPrivateProxy. Their proxies allow you to surf the web in safe, secure privacy, protecting your data and identity. They can offer you and your business anonymity across the internet by using their elite proxies. Their proxies are great for a broad variety of online activities, including employment monitoring, tracking and monitoring your employees’ online activities, online application development, online games, classified ads, social media activities, and many more! All of these features can be used to not only enhance your online experience and safety, but also your income (if you are using it for a business). YourPrivateProxy offers dedicated IPs, unlimited traffic and bandwidth, multiple subnets, many cities and locations to choose from, highly anonymous proxies with HTTP/HTTPS/SOCKS5 protocols, a control panel for checking on your proxies, no set up fee, and a set up time of only 5 minutes! You may have noticed that their prices are fairly high compared to most other private proxy providers. While this is true, they offer a higher quality proxy than a lot of the other competition. So always keep in mind that you get what you pay for. There is a 3 day money back guarantee with an instant refund, so there isn’t any real harm in testing the service. They offer a month to month subscription service without any long term obligations or contracts. You can cancel your subscription at any time. This is great because there is little risk in trying them out, since you can leave and move your work to another service whenever you feel so inclined. They currently only accept PayPal as a payment service. This may be a little inconvenient for some prospective buyers, but I imagine that most potential purchasers shouldn’t have an issue with this since PayPal is so widespread and standard. Still, it would be nice to see them start to accept other payment methods, and it says on their site that they are looking into adding more methods. The actual purchasing process is quite simple. You simply add the desired plan to your cart, as you would expect, pay using PayPal, and after the payment has been confirmed they will make your account status to active and give you access to your proxies within 5 minutes. They also allow you to test a user account and one private proxy for 24 hours, commitment free, if you would like to try the service first without making a purchase. Also, if you refer someone to the site, they will pay you 30% of the sale that you helped them make. These offers are a testament to what a high quality service they offer, and helps to justify the slightly high price. Their Data centers are located in multiple cities and on multiple subnets, with 29 locations in total. Most of their datacenter locations are in the US, with a few in other international locations. Those locations include London, UK; Toronto, Canada; Vancouver, Canada; Amsterdam, Netherlands; and Frankfurt, Germany. With a new account, you will be given a VIP user control panel. You will be able to randomize and change your proxies, including their locations, with this control panel once per month. They offer a ticket based customer service program that only requires your name, email, and inquiry. The ticket submission box is always available on the site at the bottom right of your screen, making getting support for your issue super simple. They have 24/7 customer support that usually responds within at least 12 hours, usually faster though. So you should never have an issue with getting support. Their website is a little out of date looking, but it is super easy to use and full of helpful information. They make it easy to find out everything you need to know about their service, offer video and written tutorials, have a blog and occasionally post articles to the site. They have a weekly newsletter that you can subscribe to as well, so that you are always up to date with the latest happenings on the site. Overall their website is very user friendly and it makes the process of managing and purchasing a proxy through them very pleasant. Their service supports Socks5, HTTP, and HTTPS protocols. And for Proxy Authentication they use both User/Pass and IP authentication that allows up to 5 incoming IP address. So you should never have any problems when trying to log in to access your proxies. They also offer a control panel for managing your purchased proxies and checking their statuses. This allows you to quickly identify any issues you may run into, make quick changes when necessary, and make sure that your proxies are always running at their optimum level to ensure your slightly pricey purchase isn’t made in vain. YourPrivateProxy.com gets a really good rating on sneaker proxies for the quality and speed of their dedicated proxies. The lack of bandwidth constraints and the ability to randomize your IPs monthly (a great feature) is very commendable. YourPrivateProxy’s servers work with any proxy/SOCKS softwares, have no file or image restrictions, are highly anonymous, have an uptime of 99.8%, offer unlimited bandwidth, and much, much more. Even though the price is a little high, they have the service and support to back it up. You can’t really go wrong with YourPrivateProxy, and we recommend them to anyone in need of a decent proxy package. And you can get one of the YourPrivateProxy review, also If you are already his consumer, Please share your review at here. Cheers! Bought 20 ip addresses over the weekend (it’s now Tuesday). Have loaded 14 of them into proxy switching app and test them as I go – so far 6 out of 14 don’t work. Alexandra was great selling me the 20 proxies – now their chat function has been offline for 2 days. No phone # for them. Lost my password and can’t reset it b/c their Lost Password function doesn’t appear to do anything – take you to a blank page, doesn’t email a reset link to you. I don’t get all these great reviews – I am NOT impressed at all. YPP proxy service is amazing! I use these proxies for everything but mainly purchasing consumer products. His proxies are never dead and they will be replaced very fast if you don’t like the proxy. 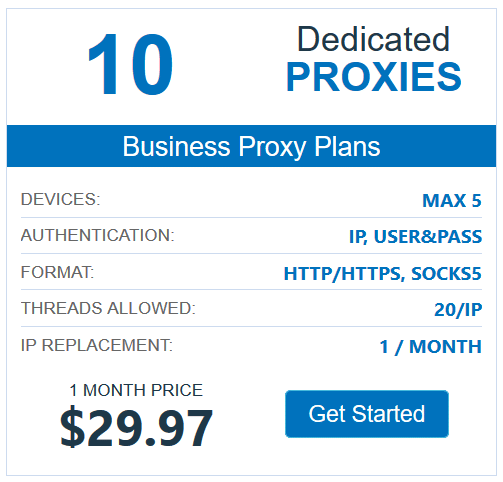 These proxies have many different locations and you are able to allocate each proxy as well. I was skeptical at first but I have to say since getting these proxies from YPP I have not missed any yeezys yet. I have been in the bot and sneaker business before the bot craze began and have delt with almost every proxy provider out there and YPP is the is better than all of them. Their proxies are top notch and the best for the price. I requested the free one day trial they advertise on their website. Filled out the form and never heard back. Created an account and clicked chat. Spoke to someone named Alexandra, who did not help. Do not recommend this company based on their poor customer service. Work great, always come through for me. Regardless of what anyone may say about the proxies, I can personally say that they are the best proxies I have ever purchased. I have been in the bot game for a long time and I always need proxies. I have tested out a dozen, if not more companies and none of them could ever beat YPP. The speed is the best, the support is the best, and their support is top of the line. I bought 100 private proxies and i think the ips are shared and not dedicated as they are saying because after ive created my ig accounts 1 / proxy and i never used the accounts, i just registered , all the accounts got banned, i did not mix up the accounts with the proxies and all accounts has been reopened from the same ip. i gave the proxies to a friend of mine who is making craigslist classified ads and none of the proxies worked to make a single live cl ad. I have contacted support and i had to wait more then 24 hours for a response, so if you guys are looking for dedicated proxies you should look elsewhere ! I am very happy with the speed of the proxies and with the uptime. Proxies work well and you have have HTTPS or SOCKS5 proxies, I’ve asked support to change the proxies for me to SOCKS5 and it was done in less then 2 hours. I was having proxies with YPP…and there, all the proxies were in different c class.not like other provide.Fast and reliable proxies. Nice interface,Its easy to set up.I’ve used for Scrapeboard,Scrapebox and Xrumer,all works great for me.